I'm always on the look out for the perfect grill gloves. I have found several I really love but tend to rotate around depending on what I'm grilling or have on the barbecue. High Five Naturals contacted me to see if I'd like to try out their new silicone grill gloves in exchange for an honest review. I've been happy with some silicone cake pans I bought a while back, so I thought these looked promising. And, they do have the "cool factor" in looks. 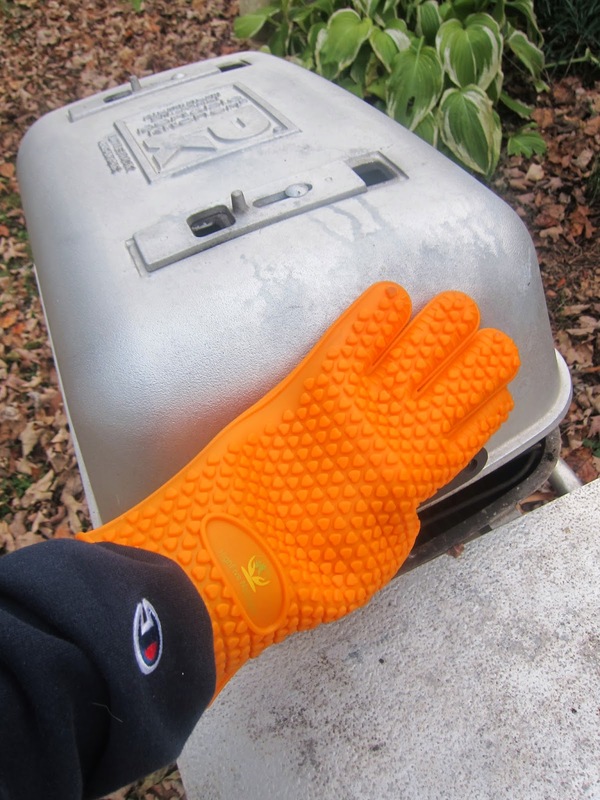 Out of the box, these grilling gloves are flashy and feel study and well made. They are one size fits all. I used my hand above to give readers a feel for the size on the gloves. Do note that while my fingers are slim, my fingers are the length of most guys. I can palm a basketball. The High Life Naturals are not as tactile as some grill gloves. The material is stiffer than the leather type. That makes it harder to use a brush to put on barbecue sauce (although you really do not need to wear gloves to do that). The big plus with the silicone grill gloves is that you can touch the grilling food. This especially comes into play when you're doing large cuts like a pork shoulder or turkey (or even baked potatoes which are hard to catch on the grill). Those big cuts and round foods can be hard to turn with utensils (even the large grilling utensils). If you turn with cloth or leather gloves, then you risk contamination and get gloves awfully messy. I've had to toss some just due to dirtiness. I'm a clean freak when it comes to food. I'm going thumbs up here for grill gloves that can be used on the actual grilled foods for turning and can then be cleaned. That is a huge plus and will save me a lot of money on grilling gloves. I'd also note that the price on these grill gloves is really good right now. It's hard to find good grill gloves at this price. We have a similar brand and you are right - they are awesome at handling hot briskets, butts, etc. I don't want anything but these for handling hot foods on the grill or smoker. Yes, they lack a little in the tactile department but are okay. The down side is they aren't very heat resistant when handling metal, I picked up a standard grate on a 400 degree grill and got a nasty burn on my hand (although it didn't damage the glove at all - the heat transferred through). Great review - you nailed my thoughts on these. I have tried getting in touch with you about advertising through your email (cyndiallison@gmail.com) but haven't had any luck. Is there another email address I should try? That's the email I use. Let me see if I can find it. This is the end of the semester, so I'm behind. The email may also have gone to spam. Sorry. Heat Resistant Gloves HoTime With Lifetime Guarantee FDA Approved Protect Your Hands From High Temperature Materials - Comfortable Anti Slip Grip Made Of Waterproof Silicon.